You are then introduced to the characters through their dreams, and each one of them is memorable. The old blind sea captain, Captain Cat, dreams of his long-drowned mates (“Dancing Williams. Still dancing”) and the one love of his life “that was sardined with women”, Rosie Probert. Myfawny Price “dressmaker and sweetshop keeper” dreams of her lover Mog Edwards. The couple write passionate letters to each other (duly steamed open by the mailman’s wife) but never meet, although they live in the same village. Then there is Butcher Beynon, who dreams of “sneaking up on corgis with my little cleaver”; Polly Garter with babies from several men (“Nothing grows in our garden but washing. And babies.”); Dai Bread the baker with two wives, “one for the daytime, one for the night”; and Mrs. Ogmore-Pritchard, a twice-widowed guesthouse owner obsessed with hygiene, who won’t rent a room to a man because he might “sneeze on her china”. And then there is the Reverend Eli Jenkins, whose sermons are poems about the village he loves. 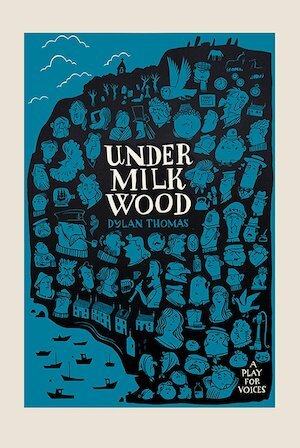 My decades-old love of Under Milk Wood began when, as a teenager, I found the recording in my father’s collection. I had no idea what it was about, and it took me a while to get into—I kept waiting for a plot to develop. But repeated listening paid off, in which I was helped by my then boyfriend (and now my husband), a big admirer of Dylan Thomas. (I still joke that he dated me only because he found out that I had the record!) And the story doesn’t stop there but continues to the next generation. My nephew staged a memorable performance of the play at his university. Under Milk Wood is funny, sly—Llagergub spells “Bugger all” backwards—and moving. And all these years later, when I hear or read the opening line, “To begin at the beginning”, I feel I’m being transported to a familiar and well-loved place that I will never tire of. I cannot separate the book from the recording. If you have the time, I recommend buying the CD or downloading the recording (the 1954 one with Richard Burton playing First Narrator—please don’t see the film). I promise you won’t regret it.